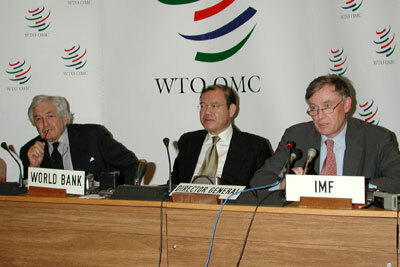 Supachai Panitchpakdi, Director-General of the World Trade Organization, Horst Köhler, Managing Director of the International Monetary Fund, and James Wolfensohn, President of the World Bank group, made the following statement on the occasion of the WTO General Council meeting on coherence, in Geneva on 13 May 2003. At this critical time, political commitment to multilateralism in economic policymaking is more important than ever to enable all countries to share in the prosperity that globalisation offers, and to ensure that a more prosperous and equitable world becomes a more stable and secure world as well. Over the past few years, governments have agreed on such ambitious initiatives to support development as the Heavily Indebted Poor Countries (HIPC) Initiative, the Millennium Development Goals, the Doha Development Agenda and the Monterrey Consensus on Financing for Development. The level of ambition is commensurate with the scale of the challenges the world faces in each of these areas. Lowering our sights is not an option in any of them. Nor can any of the aims be achieved in isolation because lack of progress in one area makes progress in the others far more difficult. Recognising that the policies that governments promote through the WTO, the IMF and the World Bank are inter-connected is essential if the world is to achieve sustained economic growth, sustainable development, poverty reduction and financial stability. The economic interests of developing countries lie at the heart of the Doha Round. That is why we share a deep sense of concern about delays that have arisen in the Doha market access negotiations. Pledges of action are no longer sufficient. We appeal to heads of Government at the forthcoming G-8 Summit to provide the political guidance that is needed to allow the trade negotiations to move forward again before the WTO Ministerial Conference in Cancún in September. Political opinion in the G-8 needs to appreciate fully the value of liberalising world trade, particularly in agriculture – a sector of critical importance to development. Trade is vital not only for the direct benefits it brings, but also for increasing the flows of financial and real investment resources to developing countries which generate the income growth and job opportunities that help raise people out of poverty and make economies more resilient to shocks. Bold action now to reinforce long-term growth fundamentals through freer trade will boost confidence and help to strengthen the emerging economic recovery. By pulling together in a multilateral context the G-8 will help to maintain the momentum of structural economic reform over the longer term in developed and developing countries alike. In today's meeting of the WTO General Council we have been discussing how to better integrate trade, development and finance. The WTO, the IMF and the World Bank are cooperating to support the full engagement of developing countries in global trade negotiations to produce an outcome that favours the expansion of their trade. Better market access for developing countries’ exports is essential for raising and sustaining their economic growth and reducing poverty. At the same time, developing countries need to place trade integration as a central plank of their development and poverty-reduction strategies. These efforts must be backed up by more focused and generous technical and financial support particularly for the poorest countries to help them build the human, institutional and physical capital needed to improve trade opportunities and to integrate the poorest countries successfully into the world economy.